Watching your girlfriend practice her super bendy poses can be intimidating, especially when you yourself want to start yoga. Lucky for you, yoga is more about the basic poses that provide the foundation of flexibility and strength every man needs. There are a number of yoga styles that can suit your specific needs, and finding the right one for you ensures you’ll keep up your practice. Here’s why you should practice yoga, in any variation. Yoga, opposed to going to amped up gyms, employs a number of relaxation techniques, which, with regular practice, can make you calmer overall. Being forced to unplug from text, calls, and email for 60 to 90 minutes doesn’t hurt either. 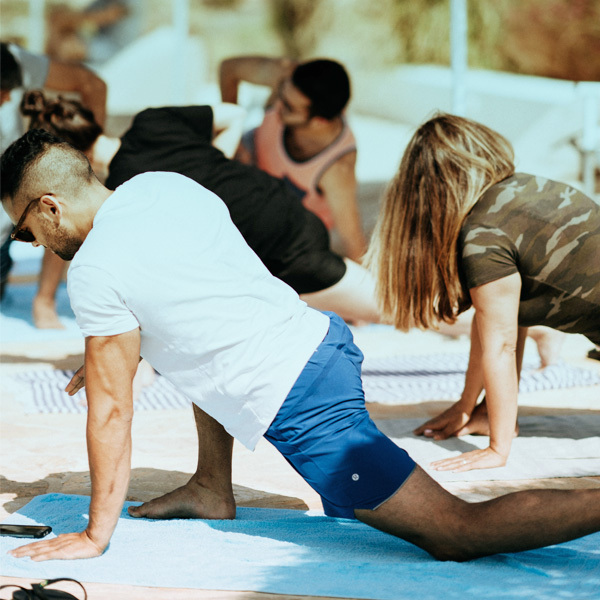 “Yoga widens the range of motion and increases access to more muscle fibres, allowing for more substantial hypertrophy in any given muscle group,” says Kate Abate, a certified trainer and yoga teacher. Hypertrophy is when a muscle is enlarged because its cells are enlarged (it’s basically muscle growth on a cellular level). Most series of yoga asanas (physical postures) include one or more spinal twists to loosen the many joints that make up your spine. This can improve your tennis game and golf swing, as well as promote detoxification and good digestion. For guys, yoga helps reduce anxiety and increases body awareness and confidence; and it speeds the release of hormones that boost arousal and increase blood flow to the genital area, which is important for erections. How to do it: Shift your weight onto your right foot, pressing it firmly onto the floor. Bend the left leg at the knee and place the sole of the left foot on your inner right thigh. Point the toes toward the floor. If this is difficult, you can also place the sole of the foot on the inner calf or ankle (but avoid the knee). Bring your palms together in front of your chest and keep your weight centred over the left foot. Press the right knee back to open the groin while keeping your hips parallel to the front of the room. Release the foot and repeat on the other side. Why you should do it: Downward-facing dog strengthens the legs and arms, while stretching the calves, hamstrings, shoulders, hands and wrists. How to do it: Start on your hands and knees, with your hands just in front of your shoulders and your knees directly below your hips. Press your hands firmly onto the floor, with index fingers pointing forward. As you exhale, lift your knees off the floor, keeping the knees slightly bent. Stretch your tailbone toward the ceiling to lengthen your spine. Press your heels down toward the floor and your thighs back to straighten your legs. Keep pressing the base of your index fingers into the floor and lift along your arms. Draw your shoulder blades against your back and down toward your tailbone. When done, drop your knees to the floor. How to do it: Lie on your back. As you exhale, bend the left knee and pull it toward your chest. Keep the other leg pressed firmly onto the floor while pushing the right heel away from you. Hold a strap in both hands and loop it around the middle of your left foot. As you inhale, straighten your left leg slowly toward the ceiling. Move your hands up the strap until your arms are straight while pressing your shoulders into the floor. Once your left leg is straight, engage the left thigh slightly and pull the foot toward your head to increase the stretch. Stay here for 1 to 3 minutes. Then lower the left leg slowly toward the ground, keeping the right thigh pressed into the floor. Continue until the left leg is a few inches off the floor. Work the foot forward until it is in line with your shoulders. Inhale your leg back to vertical. Lower the leg and repeat on the other side. Why you should do it: The wheel pose will open up the spine, shoulders and quad muscles resulting in improved flexibility and safeguard you from injury. How to do it: To achieve the pose, lie down on your back and press your feet into the ground next to your hips and press your palms on the ground beside your ears, elbows up. Press down with your hands and feet and lift up in your chest and abdomen. Only raise yourself to where you can breathe easily. Stay for 10 long deep breaths and lower slowly. Why you should do it: When it comes to building strength, increasing body mechanics and coordination. A strong core is pivotal in fitness, and it will take most of the brunt along with the shoulders, biceps, triceps and forearms. How to do it: Come into a squat. Press your hands on the ground and place your arms inside your knees with your knee propped onto the back of your upper arms or triceps. And when stabilised, lift up in your hips and belly until your feet come off the ground and your hands are the only things touching the ground. Find the Men’s Journal original article here. Aren’t up to starting your first class in the studio? Try Yogaholics, Power Living’s online yoga platform.